Thank you for your interest in Merkle’s Digital Marketing Report for Q3 2018. 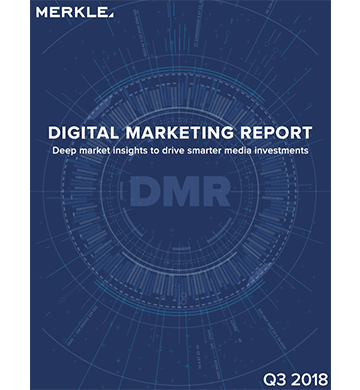 Since its launch in 2011, Merkle's quarterly Digital Marketing Report (DMR) has become one of the most highly regarded and frequently cited reports in the digital marketing industry. How Apple’s Intelligent Tracking Prevention (ITP) 2.0 is impacting Google search audience targeting. Whether Facebook ad investment growth slowed as anticipated by Facebook itself. How increased inventory for the Sponsored Brands ad format is affecting Amazon ad trends. Where Instagram ad performance stands compared to Facebook and other social platforms. What drove organic search to some of its best growth rates in the past three years.